You surely will have experienced a midnight stroll with a good guide. But what if they told you about the blood of the gladiators in the Colosseum, the ghosts and the heretics, witches and creatures of myths and legends? Take a night tour in Rome through crypts and catacombs to explore the dark side of the capital near the Monti neighbourhood. There are only a few days left to your holiday in the city, and Rome has still a lot to say. How to make up for lost time and discover all sides of Rome, even the most obscure and bloody? Rome at night offers a huge variety of different night-time activities and guided tours. You’ll have a chance to experience a warm summer night in Rome, and see the city from an entirely different point of view, accompanied by moonlight. Let’s discover just a few of the night tours in a more mysterious side of Rome not far from the Monti neighbourhood. Sunday, Monday, Tuesday and Wednesday you can experience the enthusiasm of the audience, the majesty of the amphitheatre, the sweat and the tension one can still feel underneath the arches and in the dungeons of the Colosseum. All of this at night until the 10th of October 2018. In just an hour and a quarter you’ll see the underground cells, still well intact in spite of the 2000 years of history. Imagine the trepidation and focus of the gladiators, ready to be blinded by sunlight shining down on the arena, but especially, ready for a deadly fight. Imagine the deafening roar of the audience, tense with excitement. Ghost tours. Many roman tours are dedicated to the legendary tales that revolve around the most important historical and mythical Roman characters, who are always surrounded by a veil of mystery. The guided tours will take you through all the places that the ghosts of these men and women still haunt, to admire them in a completely different light. The organisation Sotterranei di Roma begin the tour at Castel Sant’Angelo, where, in the XV century, Beatrice Cenci was decapitated along with her mother and godmother while her brother was slaughtered, all because they’d been charged with the murder of their father. If you pass by the Palazzo de Cupis, in Piazza Navona, and see the moon reflected on the front of the building, you might see a hand pressed against one of the windows. It’s Costanza De Cupis, whose ghosts likes to surprise people at night in the centre of Rome. The roads, buildings and monuments in the Monti neighbourhood have never looked so sinister! If you love mystery, don’t miss the guided tours in the catacombs after closing time. Near the Chiesa di Santa Maria della Concezione, you’ll have the chance to explore this great example of Baroque art with a professional guide. Grim, of course, but unique. 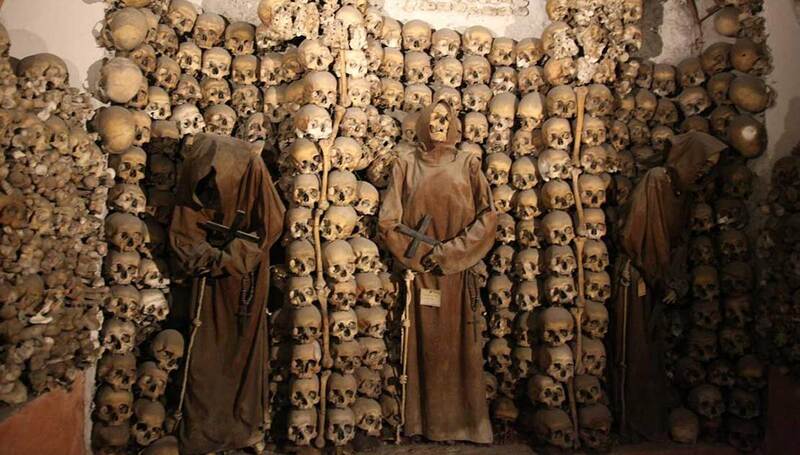 The Capuchin crypt. Here the bones of the monks create decorations and allegoric scenes from different ages. Then you’ll go to the Priscilla catacombs where the world’s earliest visual representation of Mary is kept (III century d.C.) and where you’ll see the legacy of christianity during the Imperial era. For more information, go to the website City Wonders. History, as we very well know, is full of gaps and grey areas. If you’re fascinated by symbolism, secret societies, occultism, sects and other mysteries, make sure you go on this night tour in Rome, where you’ll learn all about the most arcane characters in Roman history. A good example is the heretic Giordano Bruno, who was one of the most controversial philosophers in history, and was burned alive by the Inquisition in Campo dei Fiori. However, Rome and its guided night tours have a lot more stories about witchcraft and masonry, mystical places and legendary and mythical figures. If you’re staying in the Monti neighbourhood, take a night tour in Rome. Find information and programmes at Associazione Culturale Genti e Paesi.